Published by: HarperCollins, the little geniuses. Pages: 672, and worth every word. The time has come! My perfect fairy tale is over, sobsob. What am I going to do without anymore books in this series? How am I going to cope? 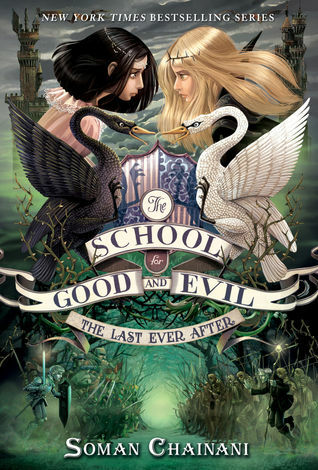 (I’ll wait for The School For Good and Evil movie, that’s what. (Can Agatha be played by a British 18 year old, would that be OK?)) Warning: this isn’t really a review, more like a fangirl gush of my feelings for this book and the series in general. Just imagine rainbows and glitter embellish this review, and you’ve pretty much understood my feelings. I LOVE this. Like, really really really LOVE it. Soman Chainini can do no wrong. With that said, on with the review! Agatha and Sophie think they have their happily ever afters sorted. Well, they’ve thought that at the end of book one and two, but we all knew they weren’t happy. Agatha and Tedros are out of the honeymoon stage, and Sophie’s had to accept her evil heart and her evil love. But their fairy tale is called ‘The Tale of Agatha and Sophie’, right? It wouldn’t be the end if they weren’t together, so, we’re launched into the story which is basically 600 pages of normally fairy tale boarding school shenanigans complete with a few zombie villains for good measure. I’m not going to spoil the ending, that would be evil of me, but I will tell you I was extremely pleased. Tedros, man. What a prince. This guy has it all. I love his relationship with Agatha. I love that everything felt more fragile and vulnerable in this book: they were learning to love each other beyond appearances and actually open up after a very ragged past. Each of them have things which burden them, but in the end they’re so MFEO: Made For Each Other! Sophie has always pulled at my heartstrings. I think, like Agatha, my beautiful, beautiful Agatha, I’ve never been able to hate her no matter how back-stab-y and evil she becomes. Sophie is a true witch, we’ve known that since book one. She breaks the ugly stereotype but underneath it all, she still struggles with her true self. Reading about her thoughts and worries was insightful, and after three books, I felt I truly understood her character. Out of everyone, I think she’s grown the most. Agatha, despite her first book hiccups, was always destined to be good, but Sophie presented a grey area of moral intent. Did she ever have the potential for good? You’ll have to read to find out! Possibly my favourite characters are Lady Lesso and Clarissa Dovey, the deans of Good and Evil. I always liked to think that they foreshadowed Agatha and Sophie’s relationship, as best friends, proving that a witch can be friends with a princess. Love has been used too much in this review, anyway, but I loved how that element was played up in this final book. I’ll admit I shed a few tears over this duo. So, was I in love with everything about this book, series and author? Yes. Am I heartbroken that the series is over? Yes. Will Agatha and Sophie continue to live on in my heart forever and ever? Yes, yes, yes. If you haven’t read this series, read it. If you love fairy tales, handsome princes, witches, friendship, conflicts, battles, love stories, boarding schools, magic, mayhem and all things good and evil, this is definitely you’re book. Now, go, my friends and live your happily ever after, hopefully with this book under your arm and a huge grin on your face.